If you have received a single rose, you may wonder how best to care for it. Caring for a single rose is similar to caring for a bunch of roses, only on a smaller scale. Carefully trim, feed, and tend to the needs of your single rose, just as you would with larger roses. Take special care to avoid exposing cut stems and injuries to too much air. It is also recommended that you sterilize any tools the rose will touch, including the vase. Fill a vase or decorative tall container with a mixture of cut flower food and lukewarm water. Lukewarm water is slightly above body temperature, about 100 degrees Fahrenheit. When you place your hand in it, you will not notice the temperature so much as you will notice the sensation of moisture. This is the best temperature for water uptake for cut flowers, including single roses. Trim about an inch off the end of your single rose’s stem while holding it under warm running water. Use a sharp knife or pruning shears, and cut at an angle. Remove any leaves or thorns that will be below the water line on the vase. Carefully clip them off while holding the stem under warm running water. Place the stem in the prepared vase or decorative tall container. Keep in a warm room, away from drafts and direct sunlight. You may also wish to keep the rose in a cool, dark place, such as a refrigerator, for two to three hours after transferring to a vase. This is called “conditioning,” and is a standard process used by florists to acclimate fresh-cut flowers that have just been cut. Check your rose daily to see if it needs more water and cut flower food. Roses drink a lot of water, and must be monitored closely to reach their full 7- to 10-day span of living in vases. If your rose starts to wilt or look old shortly after you have moved it into its vase, fear not. There may be an air bubble trapped somewhere in the stem, preventing vital nutrition from being drawn up the plant. Check for injuries to the stem that are above the water line. If you spot any, trim the rose again, above the site of the injury. 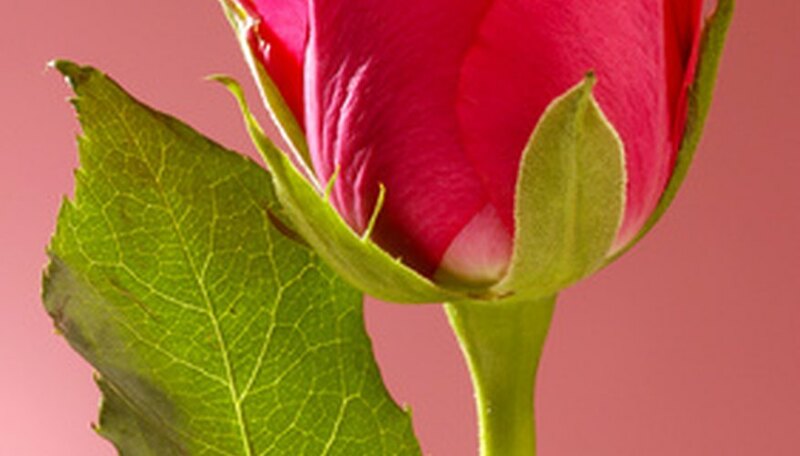 Hold the rose under warm water for a few minutes to force air bubbles out of the tender plant. This will also help replenish the rose's nutrition stores.